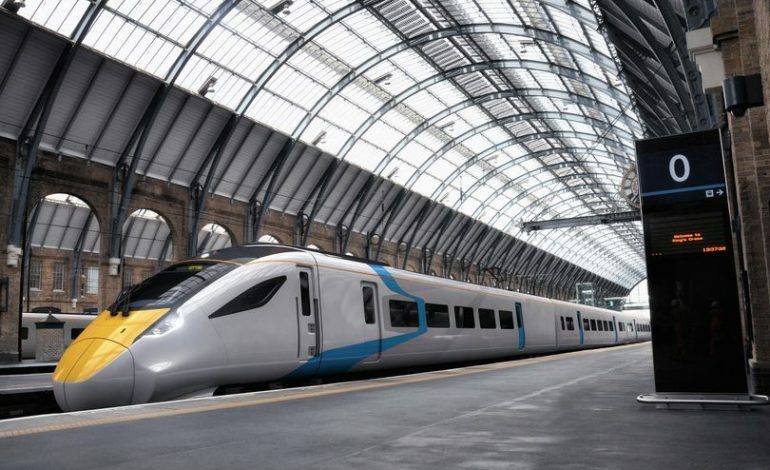 A rail firm planning a rival low-fare service between the North East, London and Edinburgh has ordered trains that will be made in the region. FirstGroup has agreed a £100m deal with Hitachi Rail for five new AT300 electric trains that will be built in part at Hitachi’s plant on Aycliffe Business Park. The service – which will run five times a day with stops between the two capitals at Newcastle, Morpeth and Stevenage – is expected to begin in autumn 2021 and will compete with the operator of the InterCity East Coast franchise, currently London North Eastern Railway, and airlines. While the news comes as a welcome boost for Hitachi, the Japanese firm says it still needs “substantial work” for the future. “Whilst today’s small bespoke order is welcome, it does not address the pressing needs of our Newton Aycliffe factory,” said a spokesman. “We are currently working around the clock to secure substantial work for Newton Aycliffe, which after spring 2020, currently has no pipeline of orders. “Since their introduction on the Great Western route, we’ve seen passenger satisfaction rates increase as they receive modern and reliable trains. Soon, we will have our Azuma trains on the East Coast main line deliver the same benefits to passengers. “In the coming months we will be looking to secure major new intercity train contracts for Newton Aycliffe to build. It is these major contracts which will support the long-term skilled jobs we have created in the North East. “Our extensive use of UK suppliers, many of which are based in the North East, depend on Newton Aycliffe winning more orders. When First Group begins operations, its first service of the day to Edinburgh is expected to arrive by 10am in a bid to attract business passengers who usually fly. Hitachi Rail managing director Karen Boswell said: “Our Japanese-bullet train inspired fleet will play a vital role in supporting FirstGroup’s exciting new service. “There’s a real gap in the market for truly affordable rail travel between the two capitals. Our plans show we are serious about competing with low-cost airlines and opening up rail travel on this key route to thousands of new passengers. Hitachi is also building Azuma trains for LNER which will come into service for the first time in May. The trains will initially be used for the line between London and Leeds, with North East stations expected to get them in the summer.